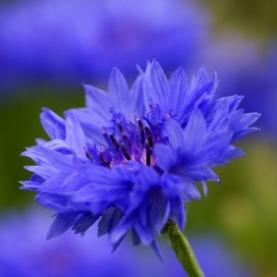 Cornflower Hydrosol is almost interchangeable with Sandalwood hydrosol for skin conditions. It probably has the widest application as an eyedrop substitute of all the hydrosols. The first choice for swollen or itchy eyes, as a compress for a stye or conjunctivitis. An excellent choice for dry, devitalized, crepey, or mature skin. Note: Avoid during the first trimester of pregnancy because of potential presence of phytohormones.